That Hole-In-One: The Other Amazing Thing About The 2016 Masters : The Two-Way Three players made history, teaming up to record three aces on a single hole on the same day for the first time ever at the Masters. Louis Oosthuizen (right) shakes hands with his playing partner, J.B. Holmes, after the final round of the Masters on Sunday. 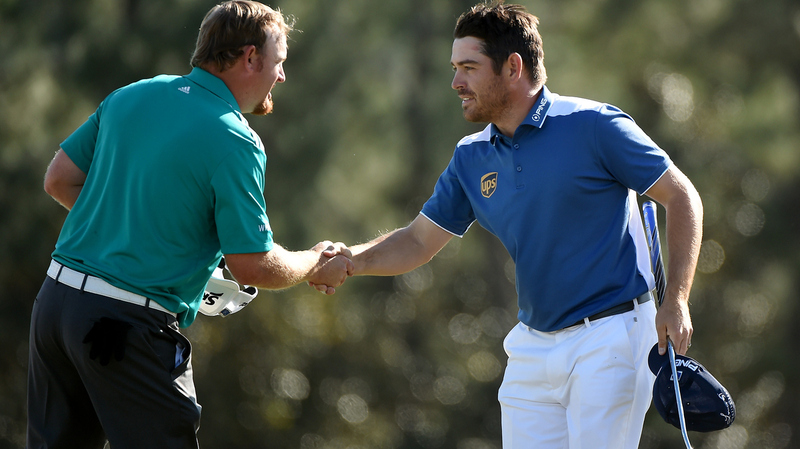 Oosthuizen made an unlikely hole-in-one after his ball smacked Holmes' and then trickled into the cup. It's the kind of shot that belongs on a pool table, not a golf course. But Louis Oosthuizen was playing in the final round of the 2016 Masters, and his tee shot was instantly called the craziest in an unlikely trio of holes-in-one made on the same hole Sunday. Oosthuizen's shot was similar to the one his playing partner, J.B. Holmes, had just hit — so similar, in fact, that his ball clipped Holmes' as it arced toward the flag on the green. Video of the shot tells us just part of the story; the other part is in the audio, where we can hear the amazement of both the spectators and the TV crew calling the tournament. Discussing his ace afterward, Oosthuizen said he initially knew he'd hit a good shot, but that he thought his ball would probably carom off Holmes' ball and away from the pin. Then, from the crowd's reaction and then seeing it with his own eyes, he knew a ball had gone in the cup. "So I was just hoping that it was my ball that was in and not J.B.'s because then neither of us would have a hole-in-one, he would have had to move his ball back," Oosthuizen said. "But, yeah, it was good, the way I played today, nothing was really happening, so it was nice to do that, to just have a bit of a better day." As you likely know, defending Masters champion Jordan Spieth, 22, was left wishing he'd had a better day, after suffering a stunning collapse in the middle of his final round. At the time, Spieth had led seven consecutive rounds at the the tournament and looked to be on his way to collecting another green jacket. "He had it, and he lost it," NPR's Tom Goldman said on Morning Edition Monday. "And I mean he really had it. He was up five shots, nine holes to play."